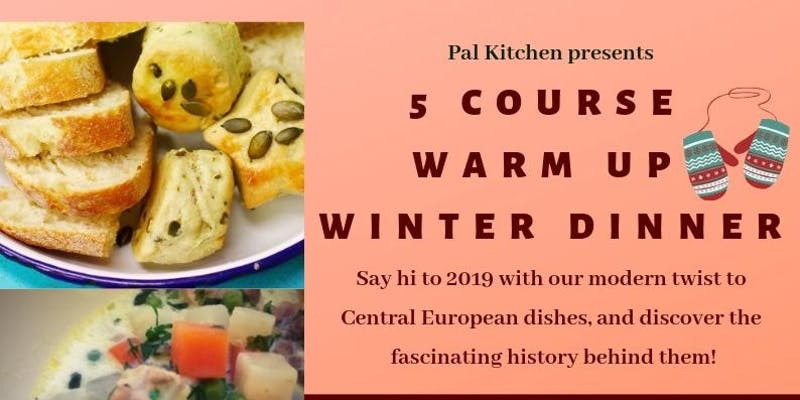 Tamas Pal's Hungarian / Central European supper club Pal Kitchen is back for a 5 course winter dinner at the Sawmill Cafe in Stratford on Friday 8th February 2019. Expect a hearty dinner among friends, with lots of food, Hungarian wines, and even a fruit brandy shot to start you off! "Following up on our successful Christmas supper club dinner, we are excited to continue the merriment into the Winter season with an amazing five course dinner. 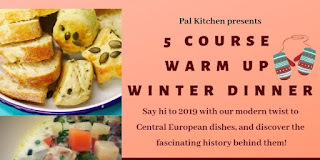 Say hi to new beginnings and exciting adventures of 2019 with our modern twist to Central European dishes, and let us take you on a journey to discover the fascinating history, customs and stories behind them. Prepare to be surprised and delighted by a menu inspired by Winter foods from Central Europe, created using seasonal UK produce, and served with matching Hungarian wine. We look forward to you joining us for a bountiful evening of eating and drinking at the beautiful Sawmill cafe at Stratford! Ticket price includes five courses and a traditional Hungarian welcome Palinka (fruit brandy) shot. The seating will be arranged in long banquet-style tables to celebrate togetherness, have a great time and make new friends."